SHANE PRIGMORE: GO SEE HOW TO TRAIN YOUR DRAGON !!! I can't wait to see this movie, Dreamworks is doing a great job with some of these 3D movies. Kung fu Panda was the first 3D movie that I actually loved everything about it. The character designs in this film look equally amazing. Can't wait to see the film AND buy the art of book. I saw the video on the character design blog and it looks incredible! So excited to see this!!! INCREDIBLE designs from the book!!! Fantastic stuff Shane! the film looks like it will be great. Dreamworks does indeed seem to be stepping up. I really, really can't wait for this movie Shane! I have the art book and I was surprised to see you had worked on it I had no idea you worked at Dreamworks. Yes, Dreamworks get a lot of flack it's true, I have a friend who won't even listen to me when I try and say something good about one of their movies. Surely though if they hired him he wouldn't say no. It annoys me! Anyway, besides that, I am super excited about this film. I love Kung Fu Panda with a passion and I honestly think Dreamworks are only getting better! I hope this does well! I'm certainly going to see it the day it comes out in England. Good luck! Hey Shane! Can´t wait to see this movie, i been waiting for it for a long time now. So great that you are poart of it and so cool you work with Chris Sanders and Dean! Beautiful characters! i can't wait for this movie. I can't wait to see this movie too! It's nice to see all style of all great characters designers are present in each character. Very nice my friend! Fantastic designs by everyone involved! Can't wait to see it! This movie looks so great! I can't wait to see it, and as always, your work is top notch. this movie looks VERY GOOD!!!!! I bought the art book, and liked too much. I am very excited to see it. When are you coming for lunch??! Great insight into the production process for this movie, I've been waiting to finally see, and finally picked up the art of book. Such a treasure trove of interesting character studies, and it looks like its going to be a worthy follow-up to Kung Fu Panda. AWESOME! Great work, and a great film (Just saw a midnight showing last night) Amazingly entertainging and fun! Your character design is very great Shane ! 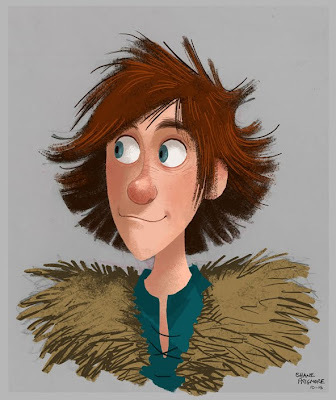 Love the Hiccup painting! I'm flipping through the Art Of book right now....p.65...amazing work! How do you approach your color work? Do you put sketches on a light table and than add ink and new line work on a heavier stock or do you work with vellum and do overlays? Great work man. 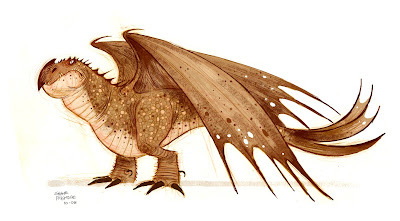 You make me want to go draw some dragons right now!! This was great. Loved all the designs! Congrats to you all- I loved it. This movie inspired me in so many ways, you have no clue! Congratulations to the whole Dreamworks crew. You guys made a film of epic proportions! awesome work Shane! How to train your Dragon was awesome, and Nico Marlet is a genius!!! and you ain't so bad yourself sir. Saw the film as well. Great work you guys. Amazing work and one amazing movie. Your work is incredible!! I agree with Chase, Nicolas Marlet needs to start sharing his gift. Very awesome! Kathy Altieri (production designer on the dragon) came to our college and gave us a nice lengthy talk on all the story and design changes you guys went through on the film, and showed us a lot of the art throughout that process. It sounded like it was quite the intense workload according the large amount of trial and error you guys went through on the film. Can't wait to do the same myself someday! Also of the two little character illustrations you posted, are they both digital? Cause they look just like gouache! If they are digital, did you use Painter or Photoshop? Also, wanted to say this but forgot, saw the movie and LOVED it! One of my favorites not only from Dreamworks but just in general! It just goes to show you how much you can accomplish when a strong team comes together. LOVED THE MOVIE! much to my surprise!march usually has the crappy movies....BUT THIS WAS GREAT! Loved seeing your dragon concepts run thru the credits! can't wait to own it on dvd. Really liked the hero design...liked the way his neck got thicker the closer it is to his head. nice subtle touch. Amazing movie, and great design. I dug it so much i went out and bought the art book for it. Dreamworks is getting up there with their animated movies. Keep it up. WOW!! I love your drawing of Hiccup. I absolutely adored this movie... Great job to the whole Dreamworks team. Pffff.... Your work is just tremendous! It's a shame the final hiccup character doesn't reach the expressivity of your drawing here... Looking forward to seeing new posts! Wow .. man !!! i love your work ... Carolne was amazing and i love also this character !!! Hey Shane, thanks for posting. This is one of Dreamworks best animated films. Not only does it look beautiful (love the vis-dev stuff, gorgeous settings and character designs), but the story is a good one. Typically a film loses me after I get over the look if the story isn't working/engaging. I saw this twice in one day. A thunder storm knocked out the power 3/4 of the way through, and it was just as good the second time... 4 hours later! Flippin heack, haven't been here in a while dude... didn't know you even worked on the film!! It's great... congrats!! I need to get my hands on the Art Of book now! Shane, your work is Phenomenal in the design of this Movie. Is there going to be a book showing the art? My desk top is getting overloaded w/ your Screengrabs. Brilliant work Shane and well done, these drawings are smashing! I went and saw the film and thought the designs were great and knew, like Panda, the art would be the reason. Well done again. I wish we had a studio like Dreamworks in Australia...anything like it. Wow I was so psyched to read this, I have seen the movie twice in 3d and both times I absolutely enjoyed it. I can remember seeing the trailer for the first time and then the anxious waiting for it to get out! When I finally went I was hopping around all day and the movie exceeded my expectations. I am studying overseas at the moment but are there any books for sale about the character development and such? Your designs are really awesome and inspiring to me! Love your work on this! The movie was fantastic and you should be proud of your contribution. I hope one day to add my own creativity to the art of an animated movie. This Blog is very helpful.. Thank you for sharing..